create naturally healthy habits while they walk! Feel motivated to walk habitually. Create positive attitudes to nutrition and movement. Download and listen on your own audio device or stream through our online course portal. Start the series now ($150.00 Special Public Offering Discount $49.95). Comes with our 30 day no questions asked money back guarantee! The Walking Companion is perfect for people who are wanting to develop a healthier mindset, as well as people wanting extra motivation to walk! Walking is fantastic for health, wellbeing, and weight, and now you can improve your attitudes towards eating, drinking, and physical activity while you walk! Here is what you will cover on your walks with Glenn. Walking Session 1 – Everyday foods. This session provides a healthier way to view “healthy” foods, helps you want to eat these foods more, and gives practical ideas for being able to eat everyday foods in small portions regularly. Walking Session 2 – Occasional foods. This session provides a healthier way to view “less healthy” foods, helps you want to eat these foods less, and gives practical ideas for being able to eat occasional foods in small portions occasionally. Walking Session 3 – Portion sizes. This session provides education on the importance of smaller portion sizes, helps you want to eat smaller portions, and gives practical ideas for being able to eat smaller portions of all foods. Walking Session 4 – Physical activity. This session provides a healthier way to view physical activity, reveals the most effective physical activity for fat burning, helps you enjoy physical activity more, and gives practical ideas on being regularly physically active. Walking Session 5 – Alcohol. This session provides a healthier way to view alcohol, helps you into want to drink alcohol less, and provides practical ideas on minimizing alcoholic drinks or completely abstaining completely from them. Walking Session 6 – Water. This session provides a healthier way to view water, helps you into want to drink more water, and provides practical ideas on drinking more water. (1) Secure payment is made through the Weight Management Psychology website, and can be made via Paypal. (2) Once payment is complete, you will be directed to a download page (a link to this page will also be sent to your nominated email address). (3) On the download page, click the download link, and the resource will begin downloading to your computer – as the files are large, this can take up to 1 hour. The files are in MPEG 4 Format, and can easily be transferred to MP3 players, iPods, iPads, iPhones and other Smart phones. Please make sure your audio files are stored to your program’s library to ensure ease of use and transferring. (4) Alternatively, stream the program through our Weight Management Psychology Online Courses portal. Hey Buddy!, I found this information for you: "Walking Companion". 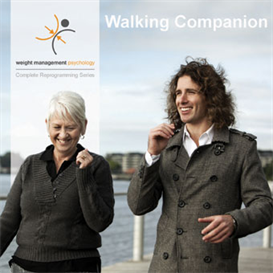 Here is the website link: https://www.weightmanagementpsychology.com.au/walking-companion-2/. Thank you.